Diminishing returns, lost market share, continued losses, or just stagnant expecting the market forces to close inn are all symptoms of accepting a level of defeat, as many dynamics are taken for granted. To become sustainable means to rise above all these forces to develop from strength to strength, secured with a vision that can shape your future. First you need to open your eyes to what you probably already know about those dynamics, but may be held back with conventional thinking. It is interesting how the gap to the unknown can be reduced by appreciating the complexity and gradually eliminating the many self-imposed limitations. Like our history of mathematics that was defined in linear terms, to discover and appreciate complexity allows a new mindset towards realising better game plans for many issues that have lingered with no effective solution. They obviously need help to tackle those elusive challenges, impossible thresholds or just to identify a better direction, better game plan and address many issues that remain ignored. The focus on Supply and Demand through economies of scale has contributed to our conditioning towards cheaper products, while pursuing something for nothing. This has resulted in the illusion of Quality e.g. short term appearance of quality with more promotion and waist. Valued substance has been lost and useful content has diminished, while any incentive to strive for value erodes. For most our definitions for Quality, Innovation, productivity has also deteriorated to make it difficult to raise those standards again. Adopting the terminology without the appropriate practises contributes to this situation. A classic example of a Value based system is evident with value based pricing that might be upheld by savvy consultants in the realisation that to achieve true innovation and a commitment to the desired results the environment must support it through trust and without constrictions. Those captivated with old management practices might not appreciate that it is all about value and not supply and demand that can be counter- productive, hindering innovation. Many bureaucracies might have innovation as the prime goal, but can only consider best practices in innovation; not realising that their current culture inhibits many opportunities to innovate further. Thus, they become dependent on outside facilitators that support their existing culture. “The Evolution of Strategic Management” (http://Books.InGeniusResults.com) helps to open our minds to these self-imposed limitations as it encompasses an education in strategies and uncovers the issues that highlight the real challenges of today. It also gives hope for a better future by identifying opportunities, e.g. create value based systems. It challenges everyone to realise the illusions and their consequences to strive towards better models, with a lift in capabilities that can bridge the known gaps. Many businesses and industries need to improve productivity, innovation, effectiveness and their revenue options but may not realise that there could be something better. Why wait for the inevitable. Can you identify a system that struggles as quality and trust deteriorates? The “Evolution of Strategic Management” (http://Books.InGeniusResults.com ) does a great job to uncover many illusions and suggest better strategies to manage personal or business challenges. This is no doubt an invaluable help for anyone, especially those that do not listen to advice, to discover how a little commitment to evolve goes a long way. The first step is to see past the illusions. It is sad to recognise how so many struggle with poor business models with little concept of the challenges and risks that they could face. To identify the illusions is not that difficult as promotions and reality seldom meet. Today, CEO’s with some well-chosen words typically state what they would like you to believe, while those that know better can recognise the difference. Politicians, when accused of misconduct, no longer claim innocence, but state that there is no evidence. For any business analysis, just follow the money trail to understand who really profits and the dominant strategy. To consider one example, as a manager I used consultants that was focussed on providing unique skills that were in demand to ensure the best profits. As my focus was the organisations development, I had my reservations when my own ideas was packaged and presented back in a tactic to give me what I wanted to hear. This was just another illusion that is still very popular, beyond the actual gap that they filled. The distinction is the value proposition that they could offer with the added value between what we want and what we really need. As a consultant this translates to significant benefits for the customer, i.e. rather than developing more dependencies, to let the customer evolve to bigger opportunities. 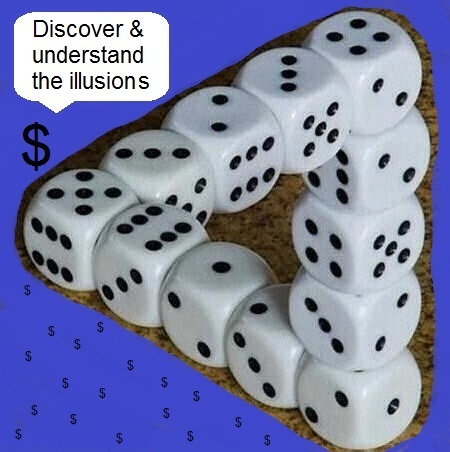 Each incentive structure can uncover illusions based on different agendas that impact performance or future options. Further examples can be seen with many outsourcing programs that could have a limited grasp of potential consequences. E.g. Automated versus outsourced administration that could be unnecessary with new technologies. What illusions can you identify? This teaser for the “Evolution of Strategic Management” (http://Books.InGeniusResults.com ) helps to explain the books reference to a void of strategies as the endless gap between limited visions, goals, poor strategies and actions. The actions that appear in many business plans is a typical example, as so many actions are confused for strategies, even when they lack the innovation, insight, and design to provide the expected results and avoid potentially adverse consequences. This sets a framework for low ambitions and expectations based on what you can manage, rather than develop the skills needed to match the challenge. Consequently, many may never realise their potential as they tend to accept and promote their results as something special, in some form of self –gratification, e.g. Heroes of their own epic dramas. This is typical with many good intentions, and action plans that fail to appreciate the dynamics and complexity of the challenge. They inevitably face the consequences as potential risks and opportunities are ignored. There are many flawed and broken systems that need some attention, starved for a better solution, or worse; accepted as the standard practice in the absence of anything better. Don’t restrict yourself by the many limitations that exist. By developing a better awareness, innovative insights and the skills to design better solutions, you not only propel the organisation forward, but lift the capability of every individual to contribute to better decisions and proposals that can make a difference. To turn this situation around, it does not take that much, that shows that “your goals are closer than you think”. With a little awareness, drive, and willingness to share your thoughts and ideas a movement can be created that will only inspire more like minded people towards designing a better solution. Let us consider one example, from the traditional real estate market that has evolved with many limitations and added conditions. Their marketing skills may be very impressive and their internet presence could improve as they offer enticing incentives for those interested to trade. In some countries you might be further restricted to deal with only one agent to avoided added penalty costs. In the past, if you wanted to sell a property, you would consider the terms of one agent, and review their conditions to identify how to change their incentive scheme to ensure that you can get the best price. Some may fall for their incentives to sell quickly at the price that they recommend as the best price; or accept the conditions as typical for that industry with no evident alternative. In today’s environment, trust is not given so freely and reputations can be lost so easily, when values are distorted and recognised as some form of manipulation. Social media now presents alternatives, even if it is still in its infancy to represent trusted networks that can communicate more effectively. Word of mouth spreads like wildfire when it appeals to the specific needs. Premium blogs can represent a level of trust, as does recommendations from those that you know in contrast to the over commercialised media. Many traditional markets follow the same characteristics with added conditions and growing distrust due to increasing costs that may not represent a fair system, i.e. Agents that only represent themselves or take advantage of their customer’s knowledge gaps. The next example is how “The Competitive Strategy” has been restricted by traditional definitions to confine opportunities by their environment, e.g. when complacency excludes new ideas. In any strategy, it is important not to restrict options while pursuing creative solutions. But, when everyone follows the same practices, the expected ambition level is also reduced. Innovation may be seen as the key to better solutions, but it is just the first step in bridging the gap of the unknown to conceive sustainable outcomes. Higher level goals may be needed to correct issues within industries, countries and the market dynamics. In the quest to develop new business models the significance of multiple revenue streams, virtual networks of allegiances and more flexibility to meet the markets needs has been realised. This approach has opened the doors to many new practices appropriate for our fast paced evolving competitive markets with many outstanding issues that still need to be resolved. Collective efforts to resolve those issues may save everyone considerable hardships and costs. The void of strategies becomes evident with complex environments when the competitive edge is made up of every element of the organisation, defining its maturity to rise to each challenge.